Theater in the Now: Review: Celebrate Your Life with MKD! Review: Celebrate Your Life with MKD! There's always time for a show at the Laurie Beechman Theater for the incomparable Mrs. Kasha Davis! Returning once again to New York, the iconic Drag Race star brings her latest comedy tour de force It Takes a Lotta Balls to Be a Lady! Through jokes, song, and lots of friends, Mrs. Kasha Davis, international celebrity housewife, entertains like few can. 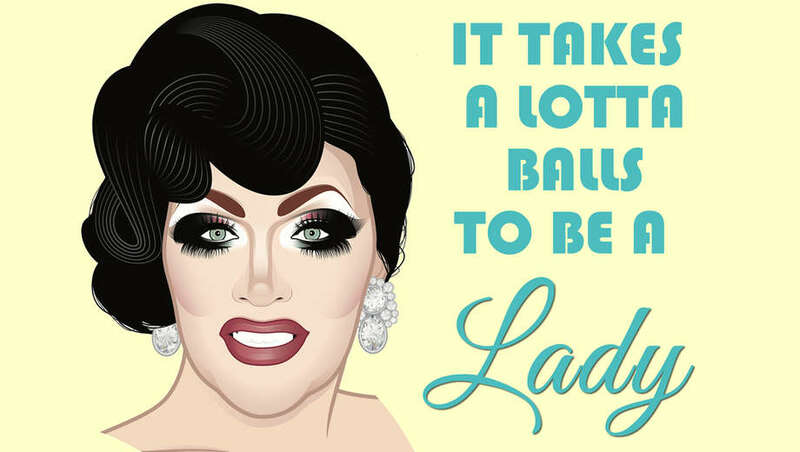 It Takes a Lotta Balls to Be a Lady finds Mrs. Kasha Davis sharing anecdotes of her past in NYC, her pet peeves, and odes to the classics. Dropping the fan-favorite digs to Drag Race and a ball-in-sack audition participation bit, It Takes a Lotta Balls is an all-in-one night of hilarity. While there may not be a strong through line from start to finish, from point a to point b, Mrs. Kasha Davis never falters, even when there's a wig cap mishap. Mrs. Kasha Davis is the epitome of a classic queen and quite possibly one of the most underrated queens to grace the Drag Race runway. Dropping standards that may not have much to the correlating story, MKD easily could have integrated numbers from her latest album of the same title. Though fan favorite "Cocktail" does get a cameo thanks her special guests the Naked Boys Singing. Utilizing them to their fullest, Mrs. Kasha Davis invites the quartet into her home alongside spotlight stealer Chris Newcomer and THE Mr. Kasha Davis. If you're looking for an iconic lip sync performance, the ball is sadly dropped. If you haven't seen her lip sync as an iconic diva before, I urge you to find a YouTube clip. It's spellbinding. With a demographic ranging from desperate housewives to the Drag Race millennial twinks, Mrs. Kasha Davis does a divine job bringing references of yore into today. She does her best Mrs. Garrett impression from "The Facts of Life", asking her four naked boy toys to don Tootie, Blair, Jo, and Natalie oversized t-shirts as she sings "Little Girls" from Annie. It's a hilarious moment but there's a very strong chance a youngster in the crowd, maybe even sharing your table, will have zero idea about the classic 80s sitcom. It defines just how hard it can be to concoct a theatrical cocktail to everyone's liking. There is no doubt about it that Mrs. Kasha Davis is an incredible performer. It Takes a Lotta Balls to Be a Lady! can absolutely be stronger with a little more arc thrown in. It's a subtlety that the crowd will appreciate. Lift your cocktail glass to the fabulous Mrs. Kasha Davis.